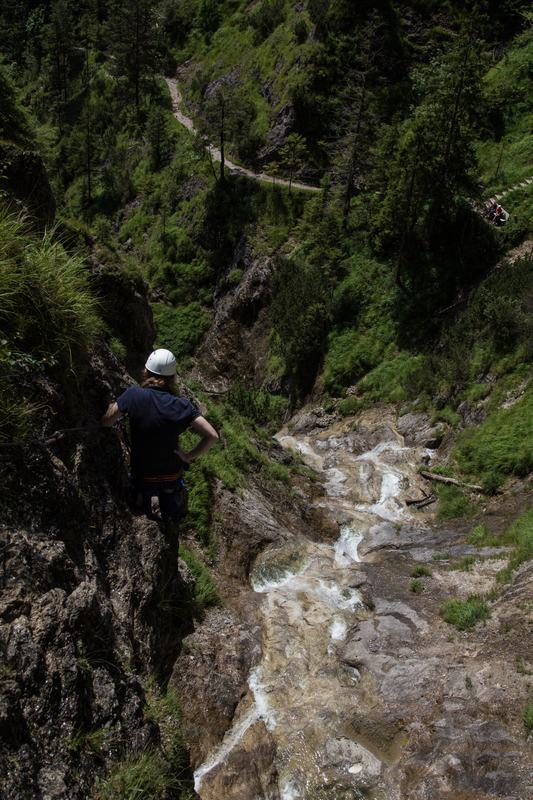 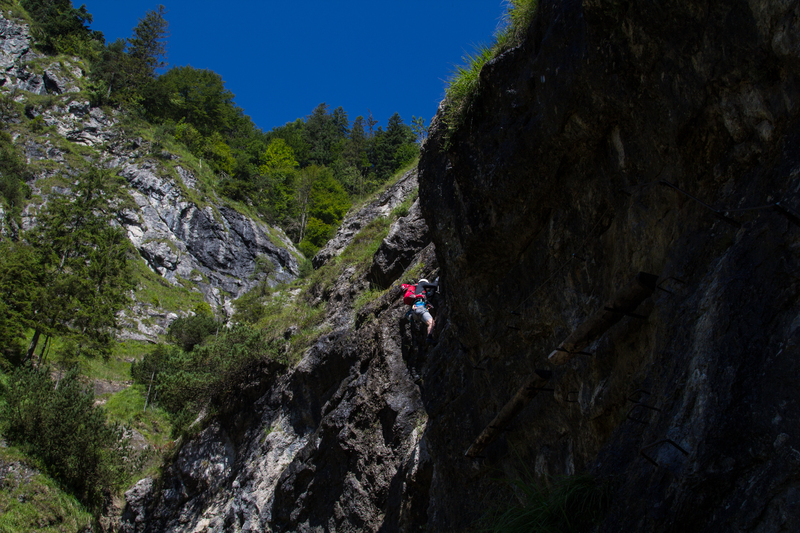 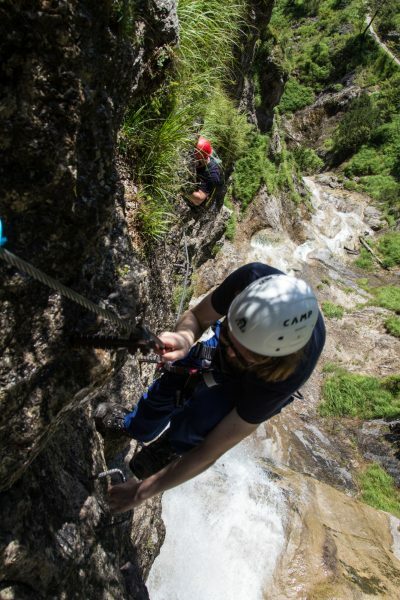 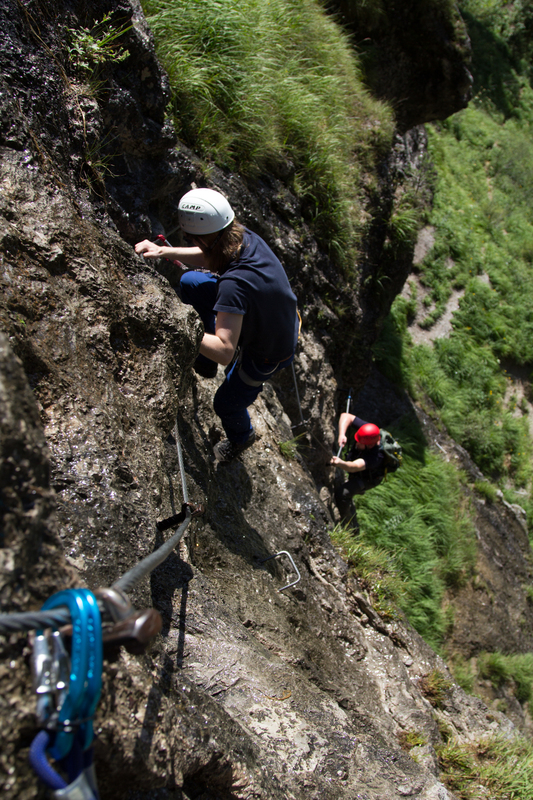 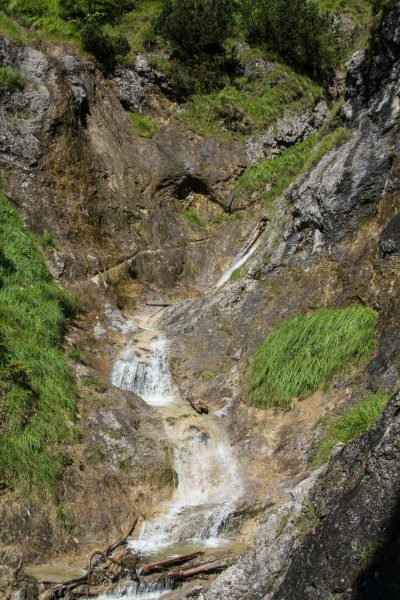 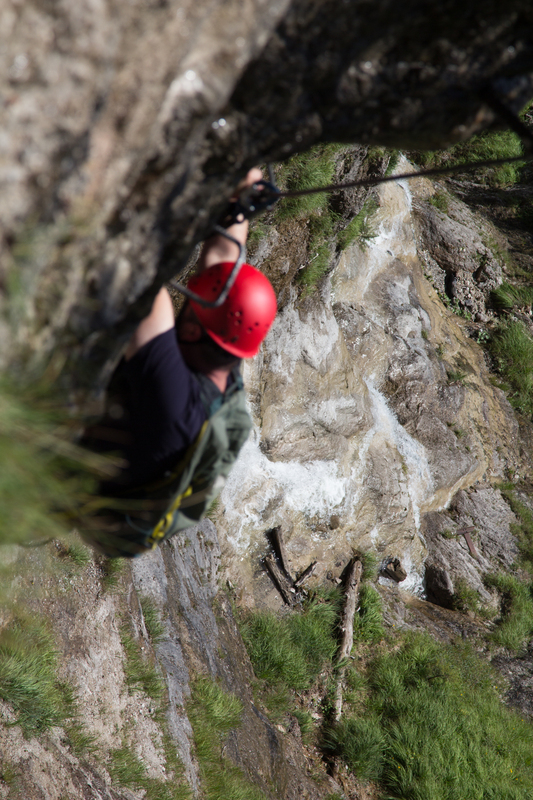 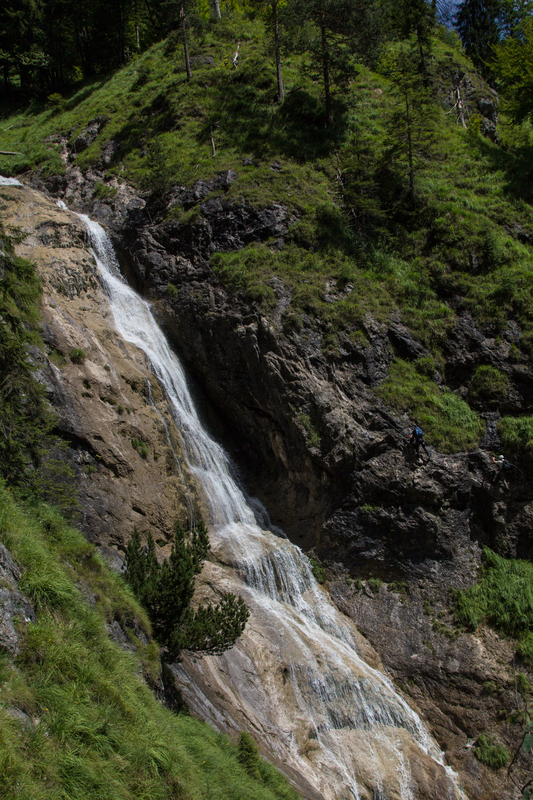 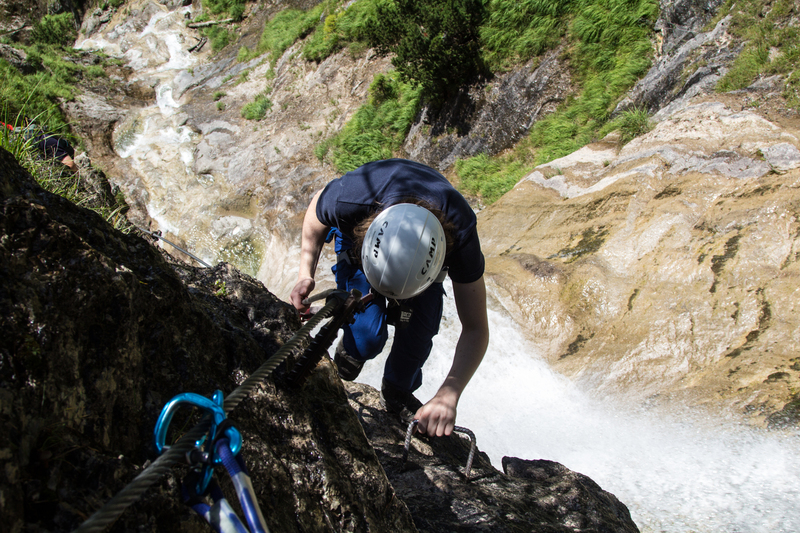 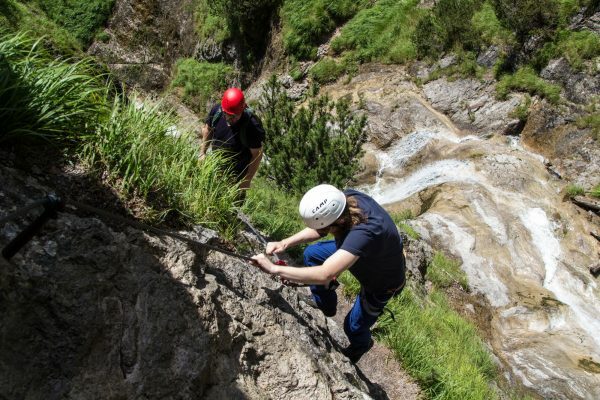 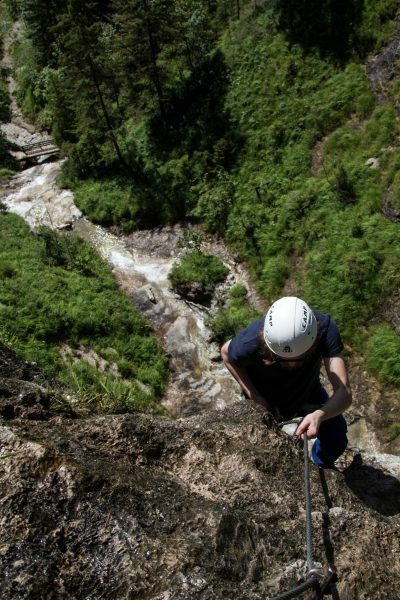 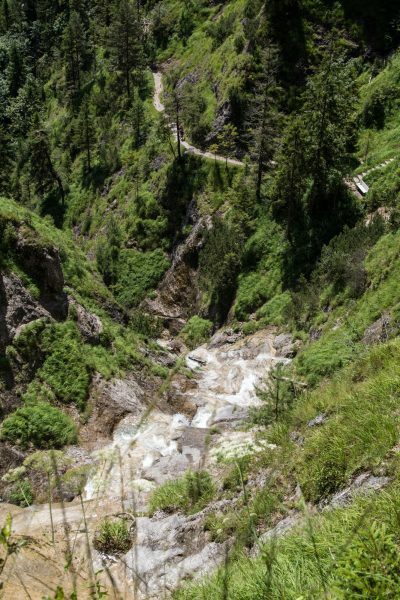 Reit im Winkl – rather known as skiing spot – has a new summer attraction: a nice via ferrata! As the setting is beautiful, right along a waterfall, the access is easy and it is not very long, I gathered some friends to check it out. 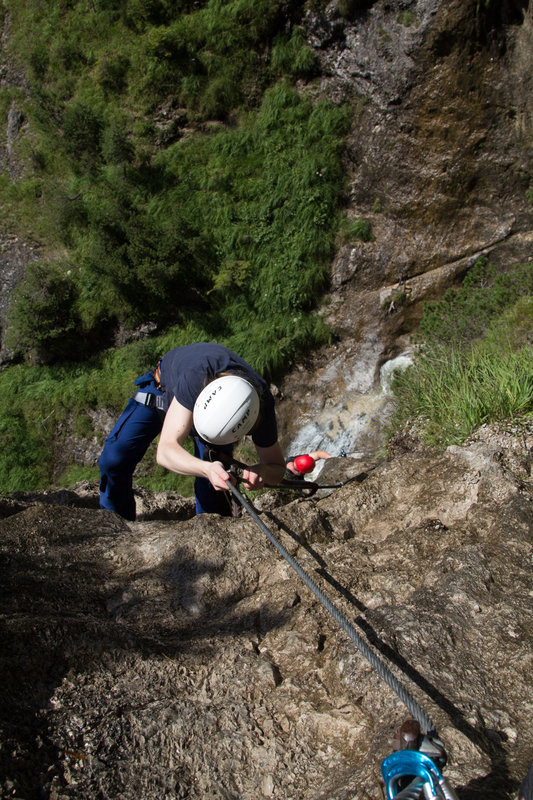 The access is really easy and there are signs guiding you from the center of Reit im Winkl. 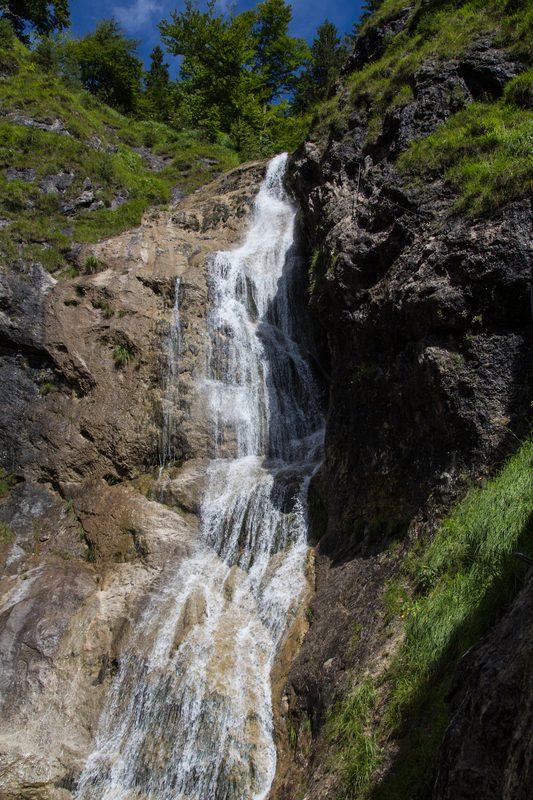 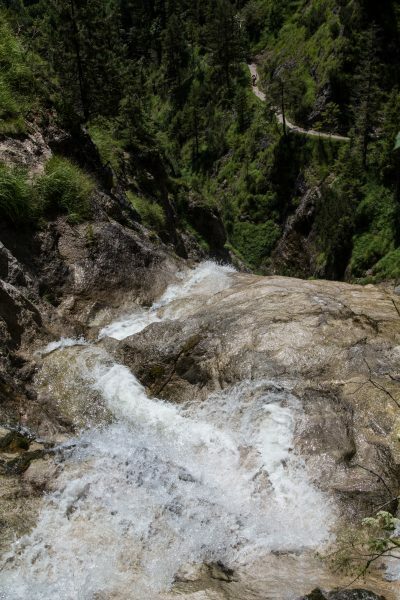 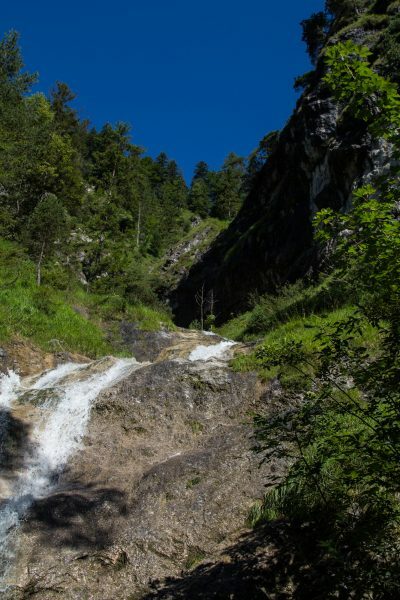 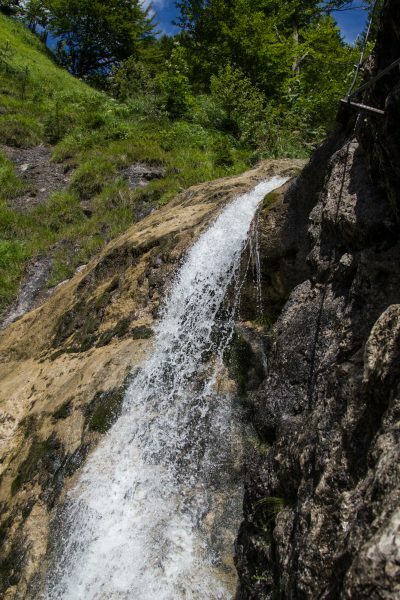 Before reaching the bridge at the Hausbach waterfall, where it starts, you can warm up in the bare foot parc or cool your feet in a traditional Kneipp bath. The difficulty might be suitable for beginners, if they are accompagnied by experienced partners. 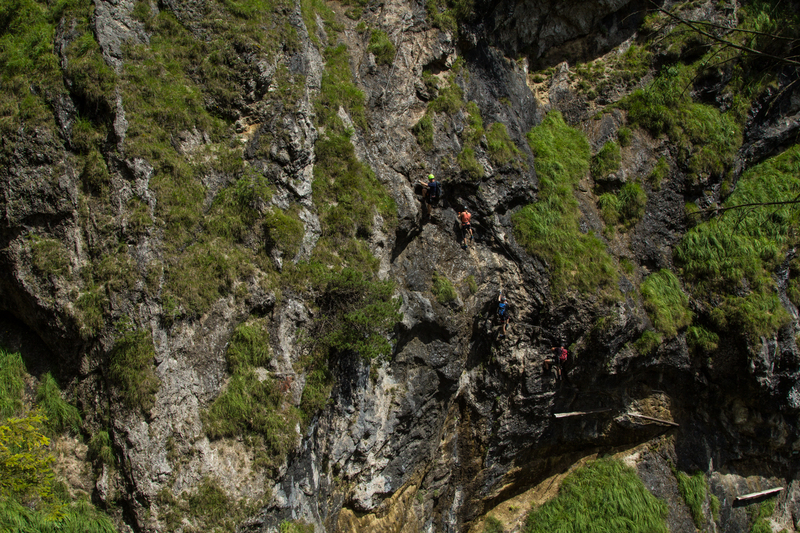 The start looks pretty scary as it is very steep and exposed, so you definitely should not have fear of heights..
One of my friends was doing his very first via ferrata here and made it without problems, but he is a fit and sporty guy. 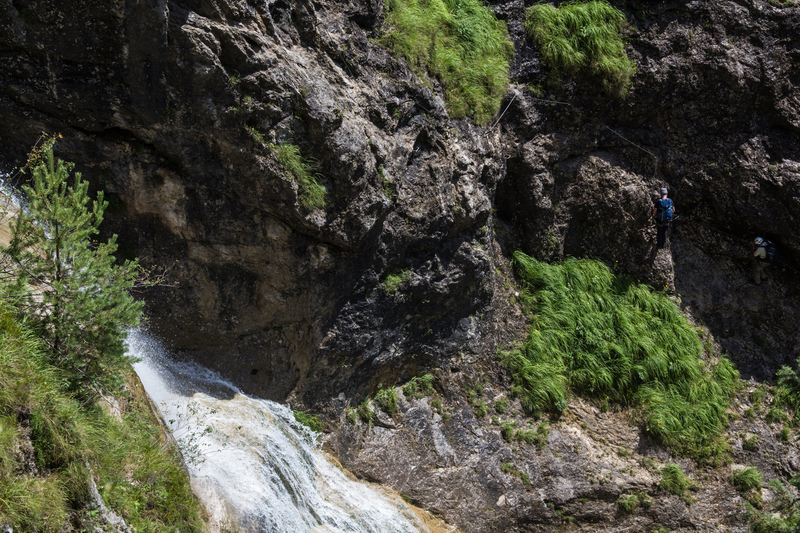 Always look for you buddies! 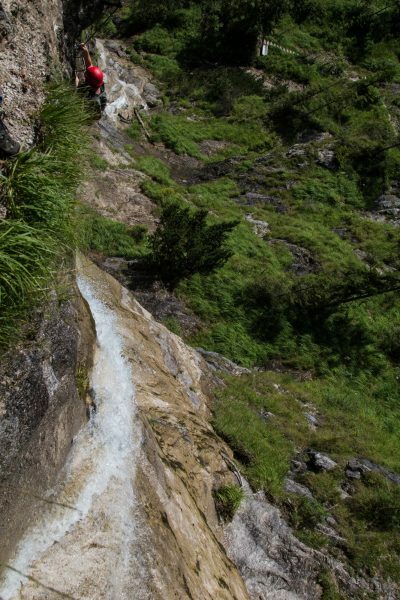 The via ferrata is not drying out fast, as there are meadows above it and they conserve the rain water and slowly pour it over the rocks. That gives you cooling on a hot day, but also rises the difficulty level and the risk of injuries due to slipping. 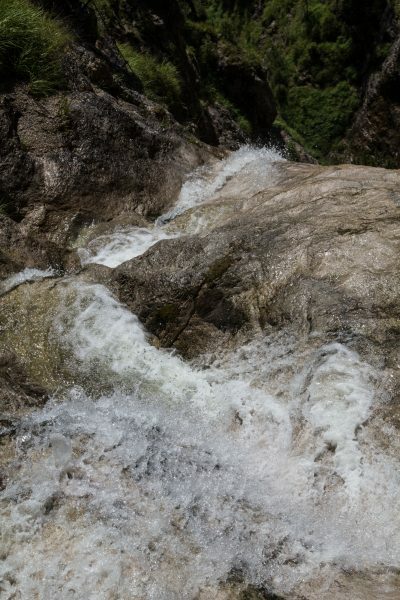 But it is still doable when the rocks are wet, you just need more power and concentration. I guess it will need 3 or 4 days to dry out properly, we had rain 2 days before! 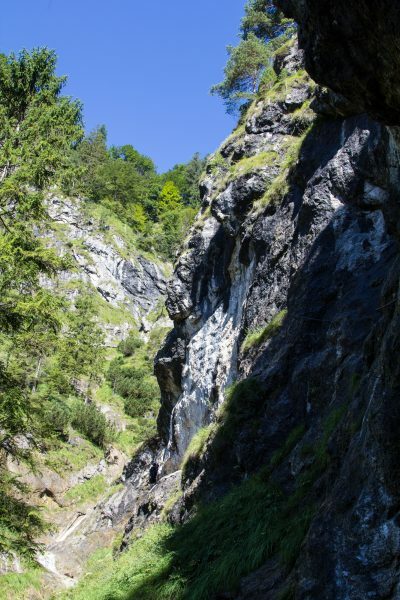 If you try it, I wish you a great day in that lovely valley! 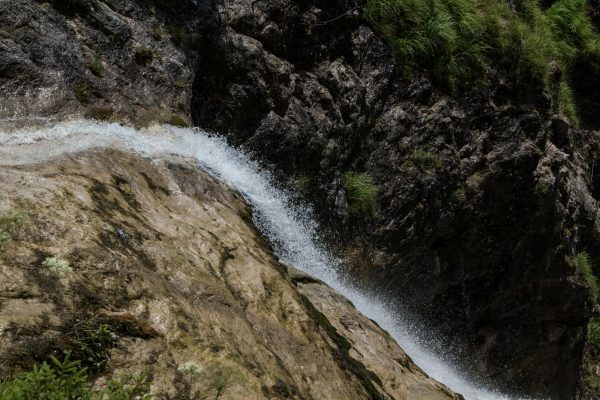 Next → Next post: Sziget Festival – one week of unleashed fun!